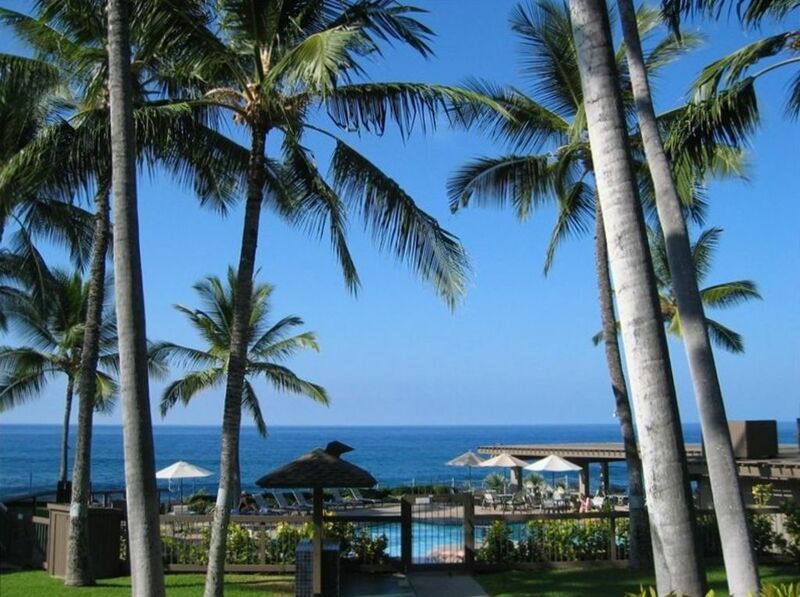 Historic and Charming Keauhou Bay is just steps away from Kanaloa at Kona. The premier resort in Keauhou Resort area. The location is perfect. Close to supermarket, restaurants, shopping, golf, beaches, sport fishing, and other vacation activities. Our unit is not in the 'Outriggers rental pool'. We maintain it and continue to upgrade amenities to insure safety, cleanliness , comfort and well equipped vacation home base for your trip. Kanaloa is a beautifully cared for Hawaiian style resort with 3 swimming pools, 2 lighted tennis courts, paths along the ocean bluffs with incredible sunset viewing. If there is a ' Green Flash' you won't miss it from here. This is a quiet and restful ocean and golf course setting that will lure you back. The peaceful setting, the singing birds and the sound of surf on the coastline will remain in your hearts for long after you return home. Our vacation had to be postponed due to a medical emergency. Mr. Wayne Twitchell despite us surely testing his patience, was so helpful and accomading! It all worked out and we had the best time! What a spot! Location, location, location! We took our cocktail with us to the Ocean Pool for the sunsets... saw the Green Flash three times! We also met a lot of really nice fun people who we hope to see again! My only suggestion would be that the kitchen could be a little better equipped for those wishing to cook at home, Again, a huge thank you to Wayne Twitchell for his help in making our stay at Kanaloa 202 possible! &#x2764;&#xFE0F; It! We stayed in #202 for almost 6 weeks. We have stayed in other units at Kanaloa for years so we knew that the property was well located and had great amenities. The condo was dated but spacious and in a very quiet and secluded part of Kanaloa. The property is gated and located on a quiet cul de sac street. I would definitely stay there again. No issues, fortunately the manager was easy to contact, we could not find the washer and dryer and it is expected to wash and dry towels before leaving. He was very helpful when my daughter forgot her jacket and made it possible to have it returned. Only 3 stars for the cleanliness because of the floors being dirtier than I prefer. The rest was fine! We're a family of 4 with 2 teeangers. The location was close to one of the best snorkeling beaches on the Island and convenient for site-seeing and shopping. The complex is well run, maintained and equipped. Only negative here is there is no sandy beach. The ground floor condo unit is spacious and clean, the main deck nicely facing a fairway at the Kona Country Club. The negatives are 1) the condo is quite dated and 2) no bbq on the main deck. Overall, pretty good value for what you get. Who had to deal with Debra the security cop? Nice quiet condo, beautiful grounds. Very private and comfortable, well equipped. beach combing, Sport and Pier Fishing, Whale Watching during winter months, Surf Lessons, Body Surfing, Parasailing (super fun and not at all as scary as it looks!!) Historical sites to explore, Massages, Championship Golf course, Golf Lessons, Nature Hikes, Meditation Centers, Art Galleries, Gourmet Restaurants, Casual Dining, Ironman Triathalon, Bird Watching, Cultural Entertainment and Lessons, Hula Classes, Hawaiian Music concerts, Peaceful Relaxing and Sunbathing is great too! !